Here we are, decision time for British Columbians! It was predicted to be a close race and according to the latest polls, it'll likely be. With that said, I believe that the numbers give a small edge to the BC Liberals of Christy Clark over the BC NDP of John Horgan. But this is a very small and uncertain advantage. So, for once, it seems things might indeed be too close to close! If I must absolutely make a call, I'd have to go with the Liberals but a NDP victory tomorrow would not surprise me much. Let's put this way: while it's a close race, it'd be wrong to call it a 50-50 race. There are more ways for the Liberals to win a majority than for the NDP. Therefore the odds favour the Liberals. Let's cut to the chase, here are the final projections. 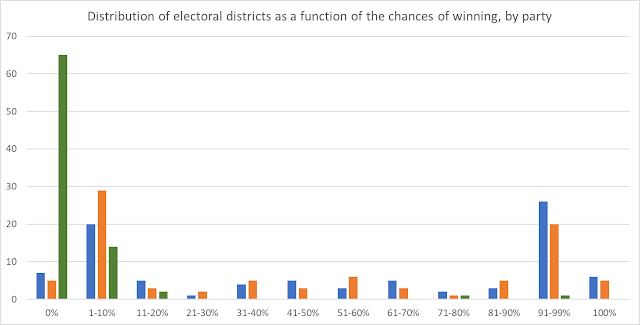 You have, in order, the voting intentions, the seat projections with the 95% confidence intervals as well as the chances of winning the most seats (it doesn't sum to 100% because of the possibility of a tie). If you want the riding by riding projection, please scroll down to the bottom. Before going into the detailed analysis, let's make something clear: this is one of the most uncertain elections I've ever covered. While I don't see it as a 50-50 races (see reasons below), it remains possible for both main parties to win a majority (with chances relatively high). Also, it seems we won't really see large swings compared to 2013 (except for the Green of course), which means that changes will most likely come at the local level - getting the vote out, new star candidate, demographic changes, etc - and polls-based projections are usually worse when it happens (simply because we can't collect much data at the riding or local level). 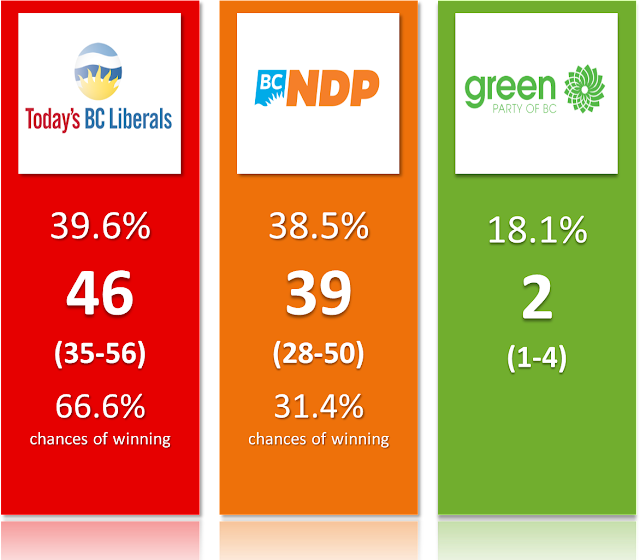 Like in 2013, the BC NDP started this election with a lead (of a couple of points). This lead became wider in the middle of the campaign (although very few polls were published, so it's hard to be very definitive about this) before seeing an upward trend for the Liberals. If we look only at the very end, it seems polls have been converging (some might say herding...). The convergence is actually pretty crazy and, quite frankly, not normal. Random samples should NOT give results this consistent. If there is a big surprise tomorrow (NDP way ahead or way below for instance), let's remember this. It honestly looks like pollsters are happy to show a tied race so that no matter who wins, they won't be wrong. But remember, polls should be evaluated looking at the average. If the NDP is 3 points above this average, even though it'd be within the margin of error of each poll individually, that would still be the sign of a systematic underestimation of this party. Anyway, let's hope for the best, right? While the Liberals climbing back up will remind some of 2013, the scenario is quite different. 4 years ago, literally every poll had the NDP ahead, even in the final days. No such thing this time around. The raw poll average is a virtual tie while my personal average (where I allocate slightly more undecided to the incumbent) has Christy Clark's party slightly ahead. Regionally, the race in the Lower Mainland has been pretty stable with a slight convergence at the end. For John Horgan, this is the key region. The NDP clearly decided to run a narrow campaign focusing on the few seats they needed in the great Vancouver (he mostly campaigned there, the main policies -$10 daycare, minimum wage, housing- are mostly for this region as well). As I show below, the path to a NDP victory necessarily go through a much improved seat count in the Lower Mainland. Riding polls from Mainstreet have shown the Liberals doing better than expected, most likely due to a strong incumbency effect. So while the NDP might indeed take the lead in the Lower Mainland, I wouldn't be surprised if the Liberals were able to defend the seats they currently have. Vancouver Island (note for non-BC people: Vancouver, the city, is NOT on Vancouver Island. Victoria is. Confusing I know) has seen a steady NDP lead with some marked fluctuations (across polls) for the Green party. 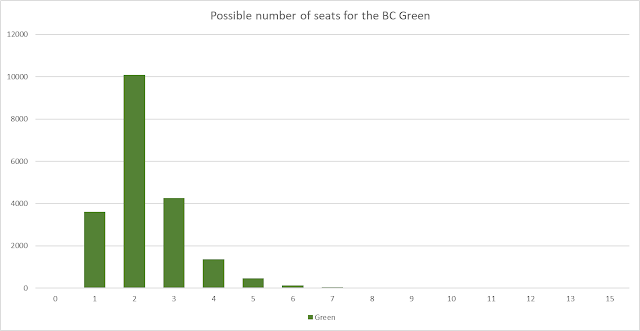 Sub-samples are naturally small but it remains that the Green at 22% or 35% would most likely have very dramatic consequences on the number of MLAs for Andrew Weaver. On top of that, riding polls (from Oracle and Mainstreet) have shown the Green doing worse than expected with the Liberals doing better (I'm thinking in particular of Saanich North and the Islands which should have been an easy Green gain based on the projections but where two different polls put them behind). Overall though, while the island is a 3-way interesting battleground, it most likely won't have the same consequences on who is the next Premier as the Greater Vancouver. I want to write a little bit more about the Green party here. It represents the "wild card" of this election. This is, after all, the party that will likely increase (or change at all) by a lot. And since this isn't a well established party, it's harder to predict where the swing will come from. Intuition and past results dictate it should on the island, but the poll average hasn't placed the Green high enough on the island in order to really win that many seats. Also, the Greens are running more candidates this time around. So the additional votes they'll receive in ridings they didn't contest last time will automatically increase the Green's share of votes province-wide. So some of the positive swing will likely be "wasted" in ridings where they have no chance and where there wasn't even a candidate last time around. On top of that, there is the possibility that many Green voters will change their mind at the last minute. Green parties have often been overestimated by the polls in the past. I didn't do much adjustment to their polling numbers because they were polling high enough not to be considered a "small party" (plus their support has been fairly steady during the campaign and Weaver likely won the debate). I'd also keep an eye for a surprise showing from one Green candidate not on the island. Likely ridings could be Vancouver-Langara, New Westminster or Kamloops North Thompson. Finally, in the interior, the Liberals have enjoyed a large and increasing lead. So much actually that it's not unlikely to see some seats going from NDP to Liberals (which could allow them to offset any loss in Vancouver). Watch out for instance for ridings like Skeena. What about the issues for instance? Healthcare and housing are always the top two and John Horgan is usually seen as better on them. Christy Clark systematically scores better for jobs and the economy. So technically, the issues should favour the NDP but we all know that undecided might be more convinced by the economy. I find it interesting that healthcare is always a top 2 issue when we talked so little about it during this campaign. We talked more about tolls, MSP (which is related to healthcare but is really more a tax issue) and nonsense like "#ImLinda" or discussing whether Horgan is too angry at times. I would say that this election is not unlike the 2015 federal one where the incumbent isn't very popular and most people say it's time for change. The problems are that polls were already showing that in 2013. Plus, as opposed to Trudeau who had the clear momentum at the end, the NDP didn't manage to gather this vote for change. 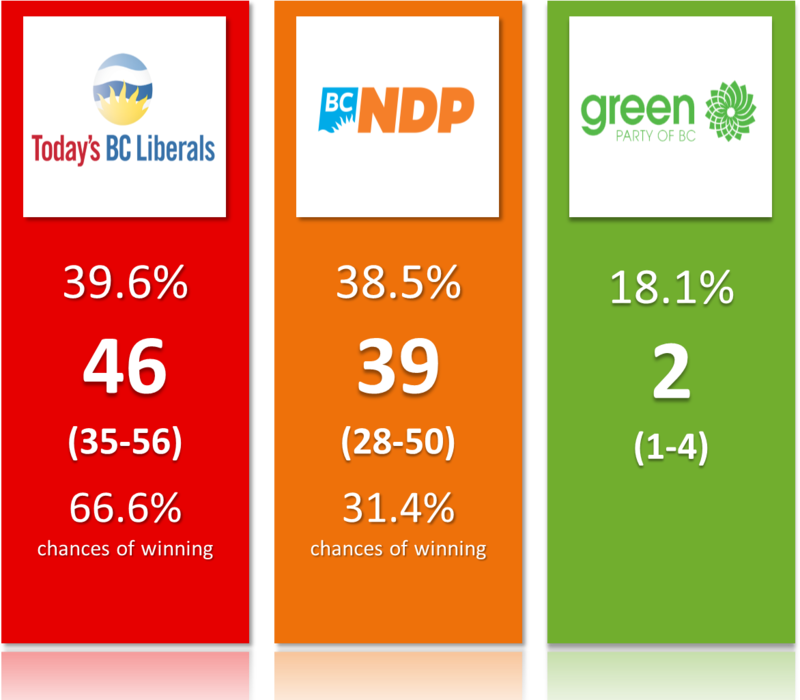 The Greens have stayed remarkably steady and the debate likely helped Andrew Weaver. If the NDP wins tomorrow, it likely won't be because of a crazy NDP wave but because of some key wins in some ridings. Christy Clark also has the leadership going for her. The last Angus-Reid poll showed that while a majority/plurality of people agree with him (on the issues), they still think the Liberals would run the province better. Christy Clark is also often seen as a better Premier than Horgan. For undecided voters making their choice literally in the voting booth, this might well make the difference. I have used Google Trends a couple of times and it seems the edge is with the Liberals as well. Note that in 2013, while all polls had the NDP ahead, Google Trends already had the BC Liberals. Using Google Trends with the names of the leaders is likely skewed because Christy Clark is so much more known than the other two leaders. While most people will have stopped reading by now, I maintain that my best work is done with the simulations and probabilities. Representing the uncertainty is more important to me than getting the exact seat count right (because, let's face it, there is some luck to it). So let's look at how much uncertainty there is. It might seem weird that the two most likely scenarios are so opposite to each other (Liberals majority vs NDP majority) but it makes sense given the electoral system with mostly only two parties. This should also be remembered when interpreting the probabilities: a close race doesn't mean one party will win by only 1 seat. In our case here, a close race means there is a wide range of outcomes and the available information isn't enough to completely exclude some. Chances of a minority are even smaller than last time I wrote about it. Again, this is the electoral system and the fact there is no third party capable of winning enough seats. The set of conditions required for a minority (NDP and Liberals around 40 seats each, Green winning more than 3 seats) are such that this outcome is unlikely tomorrow. Not impossible of course, including the chances of a tie. 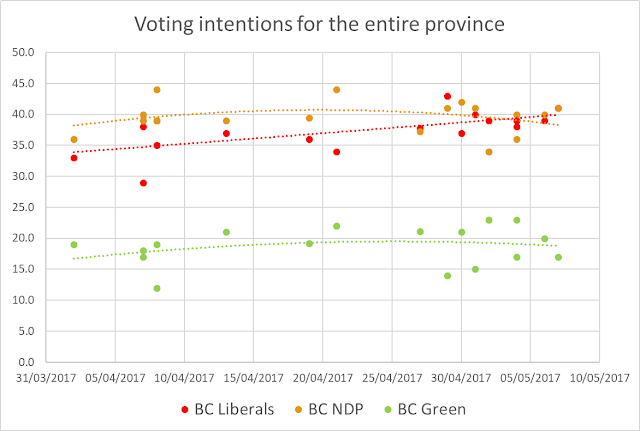 One reason the chances of the NDP are lower is because of the Green. Specifically, one source of uncertainty comes from how many votes (and where) the Green party will get. Will it be 21% with a heavy concentration around Victoria (so many possible seats for them) or will it be 17% uniformly distributed across the provinces (this would likely mean 1-2 seats max)? This source of uncertainty has a greater impact on the NDP's seat total. This is because the ridings the Green party can win would almost systematically go NDP otherwise (although the riding polls have indicated this might not be that easy). If I use my 20,000 simulated outcomes, I find a strong and negative correlation between the number of seats of the NDP and Green but no such correlation between Liberals and Green. So while the Green party is getting votes from both sides (data definitely suggests so), they hurt the NDP more in terms of seats. Call it vote splitting if you want to, I think seat splitting might be more appropriate. Speaking of vote splitting, if the regional polling average is right for the island, the Greens seem to be taking more votes (or net shares of votes) from the Liberals than the NDP. It's possible there are more transfers -like some Liberals voters switched to Green and some Green went NDP- but the idea that the Green party is only taking voters from the NDP is just not true. Here below you have the distributions of seats for each party. The bars represent how many times this seat total came up out of 20,000 simulations (Note: not 50,000 simulation, this is typo on the graph). See it the other way: in the last US election, most analysts were giving Hilary Clinton chances of winning way over 90%, even over 99% for some. Yet she lost. At the same time, saying "everything is possible" is misleading and lacking unless you also show the corresponding probabilities. We can also look at how many seats are safe for each party. Remember that the probabilities come from the simulations which do account for the possible errors of polls as well as the distribution of the vote. They are therefore valid even if the polls turned out to be wrong. Few seats are guaranteed at 100% for each party (6 for the Liberals and 5 for the NDP; remember that the current model has so far never made a mistake when calling a riding at 100% or 0%). On the other hand, there are 18 ridings that are really, really uncertain (margin of victory of less than 5%; Probabilities of winning usually at 60% max). Most of them are the Lower Mainland (13). So maybe another way to look at it is to see that the Liberals start with 35 seats with chances above 90% while the NDP only has 30. If we add ridings with chances above 80%, we get 37 Liberals and 31 NDP. This, right here, is maybe the best illustration of the advantage the Liberals start with. Among these 18 close races, the NDP is projected to win 8 and the Liberals 10. If the NDP wants to form the next government, they'll need to win a majority of these races. By the way, I'm not saying all these ridings will be close. See them as the "path to 44", similarly to the "path to 270" for the US election. In other words, if tomorrow night you see one party winning most of them, then this party is likely on track to form the government. But let's imagine the NDP outperform the polls and get 43% of the votes versus 38% for the Liberals. In this case, the NDP will win most of these ridings by a comfortable margin. I'd add to this list the one where advance turnout was the highest or increased the most. I wouldn't surprise to make mistakes in some if these ridings. By the way, given where the leaders have been, I guess they have the same numbers as us since they mostly visited the key ridings identified above. I think the number of races where probabilities are within 45-55% is insane. I didn't look at it thoroughly, but I think this is by far the election with the most "toss-ups" than I have seen. And in pretty much every single case, I can look at it in details (like the candidates, etc) and find reasons for the riding to swing one way or the other. Don't be fooled by the top line numbers: a NDP majority is definitely possible. Here are a couple of scenarios that would allow John Horgan to become Premier. This is by far the easiest way. 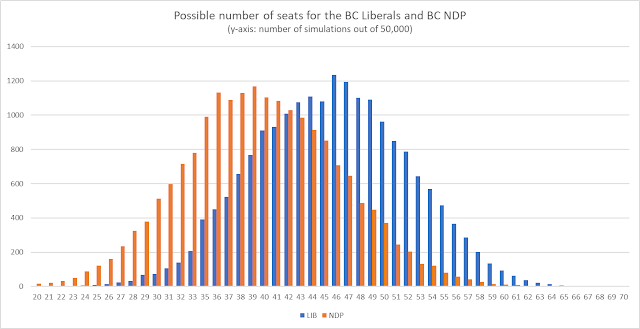 Use the simulator and input the NDP with a 2-3 points lead and you see a different scenario than the one featured here. In this scenario, the NDP would save some key seats on the island (Saanich North and the Islands, Cowichan-Valley, Esquimalt-Metchosin, etc) as well as keeping all its seats in the interior and the north, while simultaneously making the necessary gains in the Lower Mainland. In this scenario, Burnaby Lougheed and North go NDP, so would the entire tri-cities area. It would also make some gains in Surrey and North Vancouver (and Vancouver proper possibly). I'm talking here about the 13 close races in the Lower Mainland. Option a) would be far easier than option b) for the NDP. Province-wide swing is a more powerful force than grinding out close wins in key ridings. So really, John Horgan is in a position where if he wants to become Premier, he needs the polls to be wrong or he needs an efficient vote that gets out tomorrow. Polls can be wrong but there is no question that you are in a better position if you are leading rather than trailing. Notice also that I'm spending time looking at a possible path of victory to the NDP. But uncertainty works both ways and I could also write "path to a 50+ majority for the Liberals" where Christy Clark would make gains in the interior and on the island (based on riding polls) as well as keeping her seats in the Lower Mainland (she could even make gains in Burnaby Lougheed thank to her popular candidate that is a former tv news anchor) or in the volatile Surrey (Surrey might be the wild card of this election. Fast growing city with a varied demographic, big changes to the electoral map, high advance turnout, etc). Overall, I'm quite comfortable projecting chances of around 2 to 1 for the Liberals as I think it matches well with all the info available. Making projections isn't an exact science. And it's actually way more complicated and uncertain than predicting as US election for instance (and remember that they actually got that one wrong!). You need to "guess" the correct vote percentages. If polls are off by 1-2 points, pollsters will claim victory. Personally? An underestimation of the NDP by 2 points would literally cause my projections to go from a Liberal government to a NDP one! On top of that, having the percentages is one thing, getting the seat count right is another. We simply don't have enough local, riding-level data to make accurate predictions everywhere. British Columbia is also less uniform in its swing than Ontario or Quebec. It seems local events matter more, so do the local candidates. A large turnout change, like in 2015 at the federal level, can also cause problems. Regarding this, advance voting was strong but once adjusted for the number of days (and the fact that people vote more and more early), I'd say it's likely for the turnout to be similar to last time. With that said, it doesn't mean localized turnout won't have an impact but it's simply hard to take that into account. Finally, not only is this election using a new electoral map with two new ridings, the political offering is different. The Green party has a new leader, mostly new candidates (and an increased number of them). The BC Conservative who got almost 5% last time around (and got over 10% in a couple of places) are mostly non-existent. What will happen to these votes in these ridings? I tried to find patterns and correlations (since intuitively you'd expect the BC Conservatives to take more votes away from the Liberals) but I couldn't. In some ridings the Conservatives hurt the Liberals in 2013, in others it was the NDP. So I decided not to do anything there but to redistribute the votes proportionally. I think it was the safe and smart thing to do, but it'll likely cause errors in some cases (but any call or assumption would have been, at best, an educated or hopeful guess). Also, as mentioned. there is a new map with 2 additional ridings (one in Richmond and one in Surrey). A perfect transposition wasn't possible because of advance voting results. Election BC didn't even bother providing such a transposition. It thus adds a layer of uncertainty, especially in Surrey where boundaries were heavily changed. I truly think this election is a really close one. If you absolutely want me to make a call, I think a Liberal win is slightly more likely. But polls aren't accurate enough in BC (or Canada) for anyone to make a definitive call. This election might have less to do with province-wide numbers (and even regional ones) and more to do with getting the vote out in some key ridings. This makes the prediction game even more difficult. I'm leaning towards a Liberal majority. So is Mainstreet Research. And so is Election Prediction. The UBC prediction market also agrees. But as I said many times, a NDP win is absolutely possible. 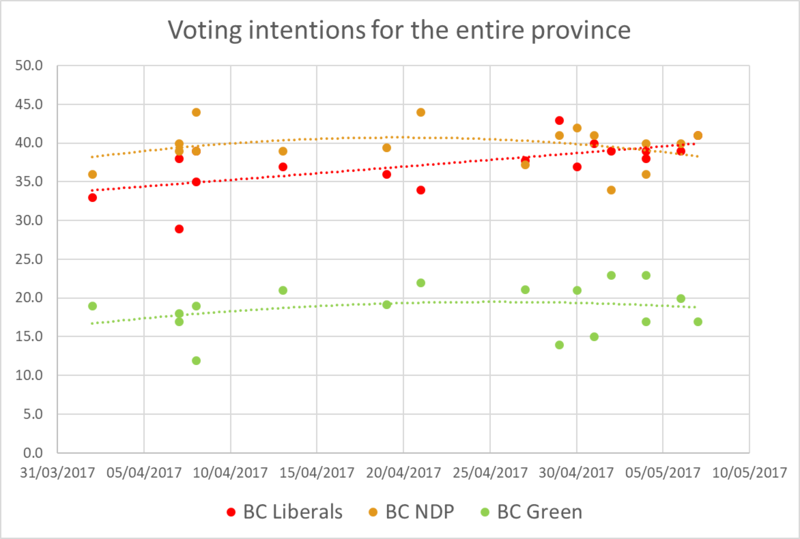 A simple swing from soft Green voters towards the NDP (like 1-2 points) would absolutely be enough for John Horgan to become Premier. On the other hand, I feel relatively comfortable with my leaning stance because if I look at the close ridings individually, I actually think I might be underestimating the Liberals (Burnaby Lougheed for instance is projected NDP but I think the candidate and demographic changes could switch it to the Liberals). Whatever happens tomorrow, I hope you enjoyed my coverage of this BC election.